Sleep is a normal state of decreased consciousness and lowered metabolism during which the body rests. As a natural, necessary, and daily experience for humans and most other vertebrates (animals that have a backbone or spinal column), sleep has four stages through which we cycle several times a night. A sleep disorder is any condition that interferes with our regular sleep cycle, ranging from insomnia (pronounced in-SAHM-nee-a) to narcolepsy (pronounced NAHR-ko-lehp-see). Although sleep is something everyone experiences everyday—the average person sleeps approximately one-third of his or her lifetime—science still has a great deal to learn about this very common phenomenon. We all recognize that sleep is a necessity and that although we can go without it for a while, it eventually becomes as important to our health and well-being as food, air, and water. We also know that when we sleep well, we seem to wake refreshed and alert, and generally feel ready to face the day. When we do not sleep well, however, we know that the chances are greater that we will feel less sharp and probably more grumpy than usual, and that everything may be a little more difficult to do. People who regularly experience a problem falling asleep or staying asleep may be suffering from some form of sleep disorder. Serious sleep disorders can wreck our personal lives, make us unproductive at work, and overall, injure the quality of our lives. The real nature and purpose of sleep has long puzzled scientists. Ancient humans believed that the soul left the body during sleep, and the well-known prayer that includes the words, "if I should die before I wake," tells us something about the fear we may experience when we surrender to unconsciousness every night. From a scientific standpoint, sleep was not able to be studied seriously until the twentieth century when certain instruments were invented that could actually measure brain activity. In 1929, the German psychiatrist Hans Berger (1873–1941) developed a machine called an electroencephalograph (pronounced ee-lek-troen-SEH-fuh-low-graf), which could pick up and record the signals produced by the brain's electrical activity. By the mid-1930s, Berger was producing a graphic picture or photograph of people's brain waves, both waking and asleep, that was called an EEG or electroencephalogram (pronounced ee-lek-tro-en-SEH-fuh-low-gram). An EEG is made by placing electrode wires on a person's scalp that receive the electrical activity produced by the brain's neurons or nerve cells. Neurons in the brain receive and transmit information and are able to communicate with the rest of the body. When they are "firing" or activated, charged electrical particles are produced. It is these charges that the EEG can sense and record. Circadian rhythm: The behavior of animals when influenced by the 24-hour day/night cycle. Delta sleep: Slow-wave, stage 4 sleep that normally occurs before the onset of REM sleep. Insomnia: Inability to go to sleep or stay asleep. Narcolepsy: Condition characterized by brief attacks of deep sleep. REM sleep: The period of sleep during which eyes move rapidly behind closed eyelids and when dreams most commonly occur. Scientists who study the brain have discovered that certain types and levels of brain activity have their own typical patterns or register their own type of waves on an EEG. They also have come to recognize and name the certain types of waves that relate to certain types of activity. For example, when a person first closes his or her eyes after lying down, "theta" waves, or waves that have a certain number of cycles per second, are produced. As a person falls into deeper stages of sleep, the waves become slower. Although they do not know exactly why this happens, scientists do know that most vertebrates pass through two distinct types of sleep, and that humans have four separate levels of sleep. In Stage I we have just fallen asleep, usually after about fifteen minutes, and we have entered a light, dozing sleep. Here we show irregular and fairly fast theta waves. Stage II is the first true stage of sleep, and our EEG registers "spindle waves" in bursts. Stage III marks the beginning of deep sleep, and theta waves that are slowed-down appear. Stage IV is our deepest sleep and has the slowest waves of all, sometimes called delta waves. This progression from stages one to four takes about one hour, and then the cycle reverses itself, going backwards to Stage I. This entire cycle repeats itself three or four times during the night. At the end of the first cycle, each time a person reenters Stage I, he or she begins an interesting sleep stage called Rapid Eye Movement or REM sleep. It is during this stage that our dreaming occurs, and even though this is a stage of light sleep, most people are difficult to awaken when in REM sleep. Our bodies are also very active during REM, and besides our eyes moving side to side, we usually toss and turn quite a bit. of sleep a night. Most adults average around seven and a half hours of sleep a night, although studies have shown that some people need as little as five or six hours. Regardless, everyone needs their REM sleep. We spend about three-fourths of a night in non-REM sleep and one-fourth dreaming in REM sleep. Amazingly, the brain waves registered during REM are almost the same as those when we are awake. Our sleep patterns change as we age, and infants sleep far longer and deeper than adults. Newborns may sleep as much as seventeen hours a day, while five-year-olds about twelve hours a night. Teenagers need about nine and a half hours a night, although they seldom get that much. For some reason, many people experience the best and most satisfying sleep of their lives during the middle teen years. Some very old adults need only five or six hours a night. Although sleep is something that is common to us all, many people—as many as 30 million Americans—suffer from some sort of sleep disorder or problem. Insomnia or difficulty falling or staying asleep is the most common disorder. While everyone will experience this at some time, if you regularly have trouble getting to sleep or staying asleep and feel next-day sleepiness and difficulty concentrating, you probably have insomnia. Some of the causes of insomnia are psychological factors like stress. Your lifestyle itself may cause a different kind of stress if you regularly work or party very late or drink alcohol or beverages with caffeine. An unsettling environment can be a factor, as can physical problems that cause pain. Certain medications can also cause sleeping problems. A simple description of insomnia is that it happens when the part of the brain used for thinking does not turn off. Probably the most serious sleeping disorder is a chronic brain disorder called narcolepsy (pronounced nar-ka-LEP-see). It affects some 200,000 Americans and is recognized primarily by a sudden, almost uncontrollable need to sleep that can occur at any time. Narcoleptics may also experience sudden muscle weakness, a feeling of being paralyzed, and even especially frightening nightmares and hallucinations. It can be brought on by being bored but also by being surprised, angry, or suddenly upset. The poor narcoleptic always feels tired during the day. This difficult condition is a genetic disorder, meaning that it runs in families. It is managed with stimulant-type drugs. Sleep apnea (pronounced AP-knee-ah) sounds like a funny condition when it is described, except it can be potentially very serious. Sufferers from sleep apnea can develop high blood pressure and even risk heart damage. This condition occurs most often in middle-aged men who literally stop breathing while asleep. When this happens, they usually snort or snore and gasp for breath, waking themselves up. This can happen as often as two hundred times a night, obviously wrecking any chance of a good night's sleep and leading to daytime sleepiness, headaches, irritability, and even learning and memory problems. Most cases are caused by some sort of abnormality in the nose, throat, or other part of the airway. 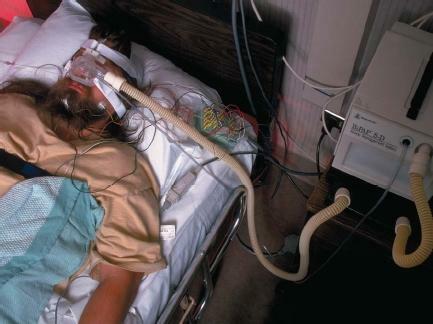 Some sufferers can wear a masklike device over their nose whose regulated pressure prevents their throat from collapsing during sleep. Others may need surgery. There are several other types of sleep disorders, some serious and some simply bothersome. Some people have Restless Leg Syndrome (RLS), in which they experience terribly uncomfortable sensations in their legs and have to move, stretch, or rub their legs all the time. This naturally disturbs their sleep. This condition is sometimes treated with drugs. Others have Periodic Limb Movement (PLM), in which their legs (and sometimes their arms) periodically twitch and jerk, sometimes for as long as several hours. Like RLS, the cause is unknown. Many people who work or are active during the night and try to sleep during the day experience difficulty sleeping. This is called a disruption of one's circadian (pronounced sir-KAY-dee-an) rhythm. This means that the body's internal clock is out of sync with the twenty-four-hour day. The "jet lag" we feel after changing time zones is a temporary example of such a disorder. Finally, many people at some time have experienced other minor disorders, such as sleepwalking, "night terrors," teeth grinding, and talking in one's sleep. Although scientists are still not sure exactly what the function of sleep is—whether the brain is "housekeeping" and reorganizing the information it took in during the day or simply conserving its energy—they do know that it provides all-important rest to the mind and body, and that rest is essential to good health. Therefore, sleep is not simply a "time out" from business. It is a necessary time of restoration. This is demonstrated by the ill effects experienced by those who suffer from a sleep disorder. This webpage has given me answers about sleep.It has given a lot of knowledge for me and for my report on sleep.